Has anyone else been having problems lately finding their favourite craft beers when they want them? Over the past several months I have had the frustrating experience, on several occasions, of walking into a liquor store to pick up a few of my favourite local craft brews only to find an empty spot on the shelf where that they usually sit indicating that they were sold out with no hopes of restocking until their next delivery. Often it has not been just one brand that is sold out and I am forced to purchase my third or fourth choice, leaving the store with a distinct feeling of disappointment. It has not just been in the liquor stores where I have been experiencing this drinkus interuptus. I have found that some of the more popular local craft brews are becoming hard to keep in stock and it is not a given that I will be able to sip on a sleeve of my favourite brew in my restaurant/bar of choice, even if that beer is one of their "regular" taps, which pisses me off at times when I have made a specific trip to that location to drink that beer. It is not that these beers are particularly hard to find. In fact, over the past few years it has become increasingly easier to find craft beers in Vancouver with more and more restaurants, bars and liquor stores carrying these locally-crafted gems. But as these beers have become more available, more and more craft beer aficionados are discovering and drinking them which is causing the supply-demand issues I have been experiencing. There can be no argument that craft beer popularity in this city is on the rise. The latest BC Liquor Distribution statistics, from their March Quarterly Market Report shows that despite the fact that overall domestic beer sales are down 9.2% in this province over the past 12 months, sales for smaller breweries, those producing less than 150,000 HL, usually the segment of the brewing world that produces craft beers, are up 7% for draft and a whopping 30.5% for packaged products!! The market share for these breweries has increased from approximately 13% in the LDB's December report to 15% in March. These smaller breweries in BC have taken their market share from 7% in 2007 to the current 15%. Yes, it looks like more and more beer drinkers are choosing local, quality brews over mass-produced swill. Samson is sticking it to Goliath a little in the BC beer market but here-in lies the problem, I believe. Local brewers are creating world-class beers which are growing in popularity because they are superior, quality products. Craft beer sales are increasing, as the stats show us, which has more and more establishments, the non-traditional craft beer bars, restaurants and liquor stores, seeing dollar signs and bringing these beers in to increase sales by riding the wave of craft beer popularity. Traditional craft beer spots are becoming more and more popular, are attracting larger crowds more consistently and are selling more and more craft beers on a daily basis. Breweries, seeing dollar signs, are selling as much as they can in this quaffing frenzy that is the Vancouver craft beer scene. But the problem is, they are, in some cases, out-selling their supply lines, leaving sales reps scrambling to keep all their customers in beer all the time. It is a juggling act for some of the sales folk for the more popular local breweries, as they attempt the impossible of supplying more beer than their breweries have the capacity to produce. I am happy that these breweries are finally getting the recognition they deserve and are slowly taking a larger bit out of the local beer market, but I wish they would slow down slightly and realize they are at capacity and should not expand their market any further until they expand their operations. Some do have expansion plans, to help keep pace with demands, while others are capping sales, happy with their current size and market share. It will be interesting to see if more breweries are able to open, to help fill the gaps left by more demand than supply. Only time will tell if this problem will correct itself. I hope the brewery owners realize this craze will stick and soon will just become the norm as craft beer continues to increase it's sales and the consumer base. I believe now is the time for careful planning, not greed. Expanding into new markets, both in the non-traditional spots in the city and geographically across Canada and into the US is great, but not at the expense of those who have supported the beers since Day One, when sales were difficult. Don't over-sell your beer please. There is no point selling to X amount of liquor stores, restaurants and bars when you can only keep Y amount stocked, leaving the others sitting with empty taps and shelves. You may not care that I have been experiencing this frustration, but eventually, if the situation continues, or gets worse, myself and others will begin to find alternatives and there are many out there as US-based craft brews find their way increasingly into the local market. For those of you who were wanting to watch Game 7 of the Stanley Cup Final at St. Augustine's Craft Brew House and Kitchen, you had to be there before 2 PM last Wednesday to stake out your claim and secure a seat. Tables were beginning to fill at noon and three hours before the puck dropped, people were being turned away, as the restaurant has adopted a strict policy of sticking to their seating capacity in order to not run afoul of the BC Liquor Control and Licensing Branch inspectors and to ensure that those who are in attendance can watch the game in a comfortable environment. The enthusiastic early birds arriving mid-day did have something to do with the excitement and anticipation of a Canucks victory that was prevalent everywhere in the Lower Mainland, but a lot of it also had to do with the fact that the Commercial Driver eatery, famous for it's 40 taps of craft beer on offer, has become the place to watch sporting events on Vancouver's Eastside. Game 6 was just as frantic pre-game at Augie's, as it has become known by many locals, and the place was full by 3:15 PM which left even owner co-Anthony Frustagli having to scramble to find a place to take in the action with friends in his own establishment. And it has not just been the Canuck's playoff hype that has made St. Augustine's a popular place to catch the games. Over the past few years it has become the gathering place for any significant sporting event for fans who want to enjoy the game amongst other sports fans while noshing on good eats and sipping great beers. Take the UEFA Champion's League final a few weeks back, pitting Barcelona against Manchester United (Boo), when the place was packed with soccer fans by the 11:45 AM kick-off. What I like the most about the sports crowds at St. Augustine's is that they are not just composed of males, swilling beers in the dark in a testosterone-fueled environment. More often than not, you will find families and female-only tables taking in the action and enjoying the vibe in the bright, wide-open space there. I love the fact that I can take my wife and baby daughter to the restaurant and find others who have taken their young ones along to get out into the world and socialize outside the home. My wife and I have met many other parents from the neighbourhood who share our comfort level in the restaurant and who love to stop by for a great craft beer and bite to eat with their families while watching sporting events. The restaurant has become a very real community gathering place for locals and more and more for parents who want to enjoy some more adult pleasures, such as craft beer, good food and sports, in a family-friendly environment, are bringing their families there on a regular basis. This success has not come instantly for the restaurant, which sits in a space that has been several different establishments that have failed for various reasons over the past 15 years or so. St. Augustine's has been the first business that has had any modicum of success at the corner of N Grandview Hwy and Commerical Drive and the owners have worked hard to build up their clientele and realize their dreams of having a sports-oriented restaurant that offers great craft beer and tasty food. The spot has slowly attracted many locals from other restaurants along The Drive who now make Augie's their meeting place and I see more and more young families and couples occupying the tables there. I can remember talking to several other restaurant owners on Commercial who literally laughed at the idea of having an eatery with 40 taps of craft beer in this neighbourhood. Most of them are not laughing now as many of their regulars have slowly migrated away from their establishments and are found at Augie's enjoying what is on offer there. The owners, Anthony, Mike and Nick, all local boys who grew up in the neighbourhood, have battled the stigma of being an establishment that shows and supports the UFC and have endured undue criticism for attracting a "UFC" crowd, whatever that means. It is true that the big UFC events are shown, but again it is an atmosphere where I feel comfortable going with my wife and in the past have done so. I have never seen any problems during these events and have noticed that there is a large percentage of couples and females watching the fights, which are take place on the televisions only and not amongst those in attendance. St. Augustine's stays loyal to their UFC-loving patrons because is is they that helped keep the place afloat in the early days by supporting the UFC events there and any reports of rowdy, stereo-typical fight crowds in Augie's are simply not true. The restaurant has also battled for its legitimate spot in the Vancouver craft beer scene. When the restaurant first introduced its 20-tap craft beer line-up, many of the local craft beer insiders shunned the restaurant because of the televisions. When the tap list increased to 40, to become the largest craft beer collection on tap in Western Canada, some still focused on the televisions and not on the great beer line-up on offer. There seemed to be an opinion and attitude among "serious" beer drinkers in this city that televisions and craft beer could not mix. I have always disputed this point of view and wonder why those holding these ideas believe that because I love sports, I should be restricted to drinking marco-beers and eating nachos in the traditional style sports bars and neighbourhood pubs who seem reticent to put craft beer on tap. I suggested to many of those complaining that if the televisions bothered them, they should maybe find more interesting friends to converse with over a beer, so they can hold their attention, or simply go to another establishment, such as the Alibi Room, which features great beers in a television-free environment. Now, with St Augustine's becoming an important place in the community for many locals and one of the places in the city to watch big sporting events, I think the restaurant has done much to break down barriers, combining craft beer, televisions, sports and community. I have noticed that as their popularity and business has grown, that a few other restaurants on The Drive have taken notice and made moves to try to attract similarly diverse crowds. It is great to see because, as a new father, sports fan, foodie and lover of craft beer, I can now enjoy social time out in the community with my entire family. There are many other restaurants out there who have televisions, show sports are family friendly and have good food/beers on offer but I would argue none do it better than St Augustine's and the local community is really beginning to take notice and realize what a great spot they have in their midst. And I often smile to myself and am amazed at how many of those original detractors, the "serious" craft beer drinkers, I now see in St Augustine's watching the big games, seemingly forgetting that televisions, sports and craft beer don't mix. A few weeks back I wrote about the resignation of Martin Williams from his position as president for CAMRA Vancouver and in that post I suggested that the next CAMRA YVR President would have to be a strong leader, able to keep the momentum moving forward at this pivotal time in the organization's history. I wrote the next leader needed to be, "an energetic, focused and knowledgeable person willing to lead and motivate the CAMRA membership at large," in order to continue CAMRA YVR's growth and development. Well, I hope I didn't raise expectations to high in regards to what was required of the next CAMRA YVR prez because, as it turns out, I am that person. Talk about setting myself up! When I wrote that post, I had no idea I would be filling the position. Being named president comes as a bit of a surprise to tell the truth. Being nominated didn't surprise me because I had let the remaining executive know I was interested, but I was sure that there would be strong competition from multiple others. There are some strong leaders in the Vancouver craft beer community, many of which I thought might like to put their stamp on CAMRA YVR during this exciting period of growth. In the end, I am not in the position because I was the best person, or convinced the executive and the membership I was the right person, I am there because I was the only person who, when asked to accept a nomination, responded with a "yes". But at this point, it does not matter how I got there, only that I am now in a position to make a direct difference working with the executive on behalf of the CAMRA YVR membership. I am a little nervous about how it will all go, especially at the start. It is always hard joining a team in mid-season but due to the fact I have been actively involved in the Advocacy and Policy Meetings and am good friends with Martin, I have some idea what I am walking into. I do have strong opinions and tend to voice them more often than not, just ask my wife. But, I believe years of experience being in leadership roles has taught me to be open, flexible and to listen to others, even if their ideas and beliefs are not in sync with my own. Many of my thoughts about what CAMRA should and could be here in Vancouver and in the bigger picture, BC, are similar to Martin's. I think the biggest similarity is that both of us feel that the membership has to be active, involved and engaged in the actual advocacy and education portion of CAMRA's mandate. Supporting craft beer and real (cask) beer is as easy as buying and consuming it, but advocating and lobbying for changes to the status quo here in BC regarding the liquor industry, specifically how it relates to the consumers of craft beer, will be arduous and tedious work. It takes energy, focus, careful strategy and numbers, as in a substantial enough amount of people to make the politicians take notice. I am a believer that CAMRA Vancouver needs to continue to grow and must become more focused and active as an advocacy consumer group to be effective. 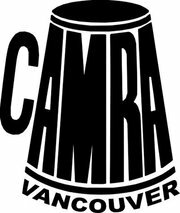 I would like to see CAMRA Vancouver executive continue to move in the current direction of trying to motivate and activate its membership. I would also like to see CAMRA Vancouver working in concert with CAMRA BC and the other CAMRA chapters in this province to formulate a plan and create one strong voice that cannot be ignored. But before CAMRA can become an effective and successful consumer advocacy group in this province, it must increase its membership, develop political connections and insert itself into the political realm. Organizing beer festivals, beer bus trips and securing 10% discounts at local establishments are activities that CAMRA should continue to carry out for their membership but I feel CAMRA here in BC can be much more than that and can actually effect positive change for the craft beer consumers of BC. CAMRA can set standards and be leaders in the local craft beer community, being proactive instead of reactive & passive. Craft beer consumers deserve to be acknowledged, considered and should not just accept the status quo, unless of course, they are satisfied with the status quo. If the membership is not willing to do so, then CAMRA YVR will never been seen by outsiders as more than a beer appreciation group for beer snobs and beer geeks. Unfortunately, many do hold this perception of our group and CAMRA must change this perception. The membership needs to continue to grow and, in fact, I believe this is key as those who are in position politically to effect change to our liquor laws and taxation will take notice quicker if CAMRA's numbers are in the thousands as opposed to the hundreds. At times, I think that those in the craft beer scene lose sight of the fact that they are a distinct minority and there are many among those who love craft beer here in this city who are not CAMRA members, many by choice. CAMRA must work hard to try to enlist these folks to join the cause and must work even harder to try to introduce those outside the craft beer scene into the fold and encourage them to join CAMRA to try to effect the changes we all want to see. These are some of the ideas I have in regards to CAMRA here in BC and CAMRA YVR in particular. Time will tell in regards to how well my ideas, hopes and wishes for the group melds with those of the membership and the existing executive already in place. In the end, it is not about me and what I want, but about what the membership wants. If it turns out that there is no will to go beyond organizing festivals and going to cask nights to socialize, my time as president may be short and I will move on to do what I do. Having said all that, we have to remember that this is about craft beer. We are not charged with curing cancer, stopping world hunger or initiating world peace. We all have families, friends and lives out in the real world and must always remember to maintain that balance. What CAMRA is doing is important, but should be kept in perspective in regards to what we hold dear in our lives. Along those lines, I will continue to blog as I enjoy the process of looking into issues, researching, writing and advocating. If you are a regular reader of my blog, you can continue to expect the same erratic, all-over-the-map approach. When I started doing this, I had no idea what blogging was really about...many will say I still don't. So, the journey as prez begins. Please feel free to let me know what it is you would like to see happen for CAMRA YVR. If you are not a member, please consider joining up and getting involved. Together we can make our voice be heard. And remember, advocating, effecting change are better enjoyed with a great craft beer in hand.